Imphal, September 13 2018: Kuki Community across the globe today observed "Black Day" commemorating the 1990s mass killing of Kuki by armed militants of National Socialist Council of Nagalim (Issak Muivah) NSCN-IM. Commemorating the Killings, September 13 has been observed as "Black day" or "Sahnit Ni" every year by demanding justice for the victims. Today is the 25 years that "Sahnit Ni" is being observed not only in various parts of the state but also across the globe where Kukis resides. Main observance was held at Tuibong in Churachandpur district in the complex of Kuki Inpi Manipur (KIM) for three days - today being the last day. The theme for this year's observance is 'Justice to Victims of Kuki Genocide'. A memorial stone for the victims of the Kuki Genocide was also unveiled during the three day observance. Speaking on today's observance , President of the Kuki National organization (KSO) said the Kuki community have been crying for justice of the victims by bringing the perpetrators of the genocide to book for 25 years. The governments both at the centre and the state had not only turned a blind eye to the human massacre by Th.Muivah and his band of marauders, but alsi shunned their ear to the cries of the Kukis for justice for a quarter of century, Haokip said. Th.Muivah led NSCN-Im is presently ensuing in peace deal with the government of India and talks are going around for a final solution to their issue after the signing of the Frame Work Agreement with the government of India. "Today, by erecting memorial Stones inscribed with the names of the victims of the Tangkhul instigated and NSCN-IM led genocide , we are telling the world and powers that be , that we shall continue to fight for justice to more than 1000 inocent , hapless kuki villagers killed , the people of 350 plus villages uprooted, the innumerable children orphaned, the many mothers widowed by the genocide", PS Haokip said. "The KNO is ready to stand with the Kuki people till that right of ours is respected , and no attempt to trample over our land and rights will be tolerated", PS Haokip said adding that they will not hasitate to go back to the Jungle if the rights of the Kukis is not respected and treated with dignity. 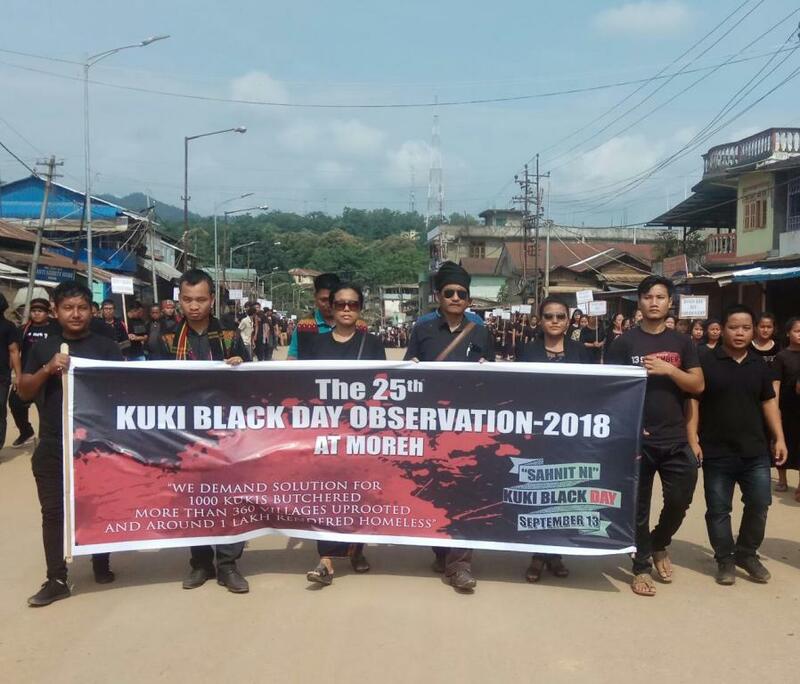 The 25th Kuki Black Day is also observed at Indo-Myanmar Border Town Moreh. Hill Tribal Council Moreh and Kuki Student Organization Moreh , Kuki Women Union and Human Right Moreh and Moreh Youth Club Jointly organised the observance. A silent public rally was staged from Galngam Lentuol Grouns to Forest Gate of Moreh from 7:30am . More than five thousand Kukis took part at the Condolences Rally.
" Not only in Manipur and India , the Kukis all over the world is also observing the Kuki Black Day", a speaker said.